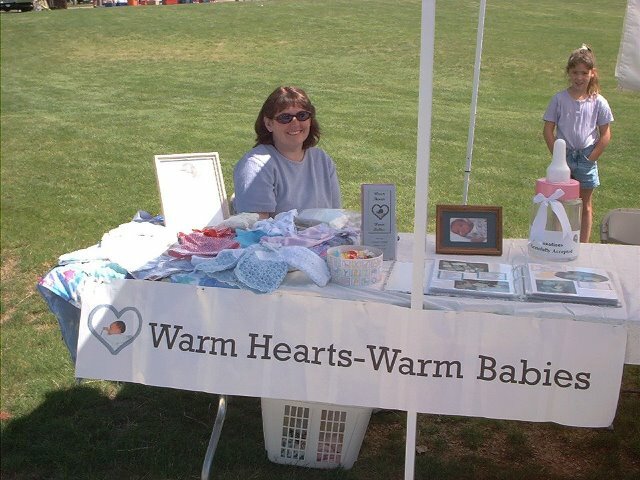 Warm Hearts Warm Babies provides clothing, blankets, and essential items to premature and newborn infants, and young children, in crisis, free of charge. We are a 501.3(c) organization that operates with an all volunteer staff which allows all contributions to be directed towards the babies. 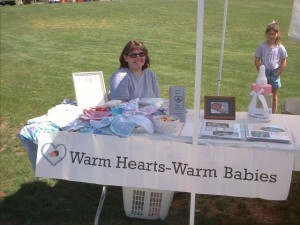 Warm Hearts Warm Babies volunteers make and donate: baby gowns, sleepers, T-shirts, quilts and other essential baby items to local hospitals, shelters and other organizations that provide for premature and newborn infants and their families in Colorado. outside world. And sometimes these painful experiences lead to something extraordinary, like an organization that can help meet these needs. In 1996, after giving birth to a tiny 8 inch 4 ounce baby, Victoria Swain found that the hospital was not equipped to clothe or provide even a blanket for her tiny stillborn infant. Driven by the knowledge that there was a need to be filled here, she looked for a way to fill that need. After contacting another program that did these sorts of things in another state, she begin recruiting Colorado volunteers and collecting materials to make donations to hospitals that had need for these tiny specialty items. After spending a couple years under the tutelage of the other group (Newborns in Need) the board members at that time voted to arrange for a standalone 501(c)3 organization to serve Colorado’s tiniest citizens. In July of 2000, Warm Hearts-Warm Babies was officially its own entity. From approximately 60 volunteers, and lots of warm hearts, the organization has grown to what it is today, serving countless agencies and individuals across Colorado. ” There weren’t really any huge struggles in the beginning. It seemed definitely like God was guiding our every step. Board members stepped up and donated money, postage and materials. We seemed to meet the people that made the things happen that we needed at the time. From the Arvada volunteer, with a doll clothes business who donated shelves and tons of fabric incl rolls of pink calico we still have to Kristi , a volunteer whose husband a lawyer that did our 501(c)3 paperwork pro bono, not to mention the local propane company that filled a propane tank at the baby house as a donation, things always seemed to get done. Our early baby house in two storage units, then a baby house in a trailer out in the country in Brighton, a basement space in Brighton next to Curves owned by one of our volunteers, where we had to schlep all our stuff up and down the stairs for work meetings and deliveries. Next, in a small studio apartment in Brighton, an empty house in Brighton , one last trailer in Brighton before the current location in Arvada. It seems like every time it was time for a move, God intervened and we found the best place to move to. Victoria volunteered with the WHWB Rocky Mountain group in Georgetown for several years. She is now newly married and living in Minnesota. One of God’s Mothers. Below is WHWB founder Victoria Swain in 2001.